Is a sanctuary filled with temptations for the body and soul. Allow the pressures of everyday life to melt away as you enter a world of exotic indulgences. Experience the true Asian touch at the hands of your therapist and begin your journey into pure bliss. Our serene, tranquil environment creates an effortless transition into total relaxation, allowing you to surrender to the experience and embrace the healing energies, a perfect spiritual retreat for a half or full day program. Re-enter the world fresh, revitalized and at peace. Is a sanctuary filled with temptations for the body and soul. Allow the pressures of everyday life to melt away as you enter a world of exotic indulgences. Experience the true Asian touch at the hands of your therapist and begin your journey into pure bliss. Please Book your Spa Treatment with us ! Please find our spa menue at the treatment tab above. 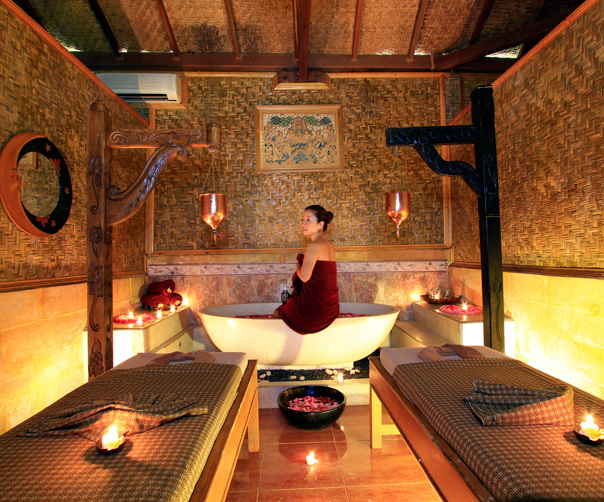 The treatment starts with a traditional Balinese deep-tissue massage with strong strokes that improve energy flow. This is followed by a Lulur scrub with its golden colour reflecting its main ingredient, turmeric, which has unique cleansing properties. The body is then coated in a cool yoghurt splash to cleanse and nourish the skin. The Balinese massage is designed to deeply relax tense muscle tissue. This is done by combining standard massage techniques like kneading, stroking, and skin rolling with gentle stretching. A favourit massage in the spa ! Firm pressure applied to body points to reactivate your Chi energy and to correct any imbalance in your body. It does so by putting or applying pressure on certain energy points on your body. An exotic ritual of Spa treatment that using Wine & Scrub to clean the toxic inside the body (Detoxification), make your skin feel younger, and make your skin shinning. Wine grapes contain natural antioxidants called polyphenols that exfoliate, detoxify, cool inflammation, and soften and repair damaged skin. This wine spa is a 2 hours treatment.